The Toronto Blue Jays decided moving Josh Donaldson now was a better idea than holding onto a star third baseman with an uncertain future, said Blue Jays general manager Ross Atkins in a conference call with reporters on Saturday, one day after Toronto traded the 2015 AL MVP to the Cleveland Indians. "Josh is an incredible player and will continue to be a great player ... As we weighed our alternatives, it just came down to us feeling this was the best [move] for us in the moment," Atkins said. Out of the lineup since late May with a calf injury, Donaldson returned for a rehab game on Tuesday night with single-A Dunedin. That allowed the Blue Jays to place Donaldson on waivers and potentially trade him prior to Friday's deadline for players to be moved and still be eligible for a post-season roster. If they didn't trade Donaldson on Friday, the Jays could have made a qualifying offer of around $18 US million and received a compensatory draft pick if he signed elsewhere. While Atkins did not mention it, one factor in the decision could have been the emergence of fellow third baseman Vladimir Guerrero Jr., the top prospect in baseball. He's expected to join the Jays in late April next year, allowing Toronto to maintain Guerrero's contract rights for an additional season. "I think every decision we make, we weigh the potential risk and upside and decided ultimately this was the best thing for the organization as we considered our alternatives with Josh," Atkins said. "We feel very good about the return. Ultimately, we felt it was the best decision for our future." "What I can tell you is that we're excited about the return," Atkins said. "It's a near-term prospect we feel can impact our major-league team in a significant way." Atkins said there was no animosity between the Jays and Donaldson for the player's decision to follow his own training program in the off-season or how his rehab was handled. 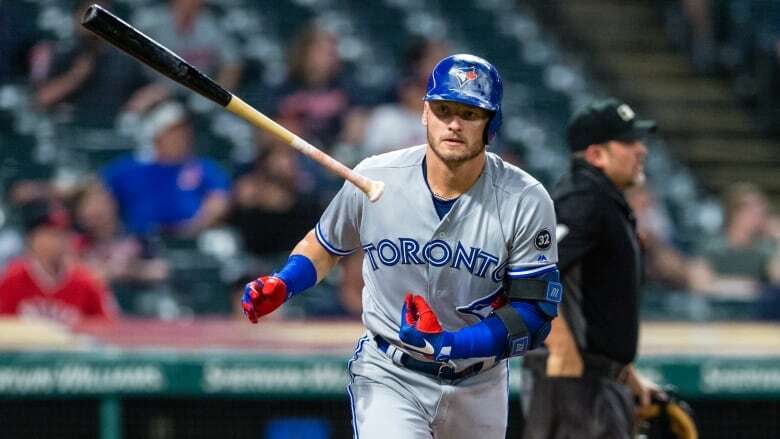 He also said there was no pressure from the Jays organization for Donaldson to return to the field, something that had to happen for the third baseman to be placed on waivers. "We were not pressuring him to play," Atkins said. "Josh was driving his timeline entirely leading us to when he wanted to play. We followed his lead on that." Donaldson hinted at frustration in an interview with the Toronto Sun this week, saying "There's a lot I can say about that [Blue Jays management], but I choose not to say anything about it right now." "It was a very difficult decision for us," Atkins said.